Leaders of pro-life groups met with Trump administration officials at the White House Wednesday to push for the defunding of Planned Parenthood, the nation’s largest abortion provider, as Congress is working to reach a deal on a funding bill by December 7th to avert a government shutdown. Live Action president Lila Rose, Students for Life of America president Kristan Hawkins, and representatives from the March for Life and the Susan B. Anthony List met with White House officials to push for pro-life goals, including defunding Planned Parenthood as President Trump promised on the campaign trail, before pro-abortion Democrats take control of the House in January. They are asking that President Trump refuse to sign any budget that does not defund the abortion group. According to their latest annual report, Planned Parenthood got $543.7 million in taxpayer funding over this past year. "Too often reproductive health care and women's health care are singled out, stigmatized and attacked," she said. "We will be expanding our reach by expanding our health care services, expanding our educational presence, expanding our political power." "It's a daily struggle," she added. "It's been hard for us to focus on growth, when we've been focused on keeping our doors open." 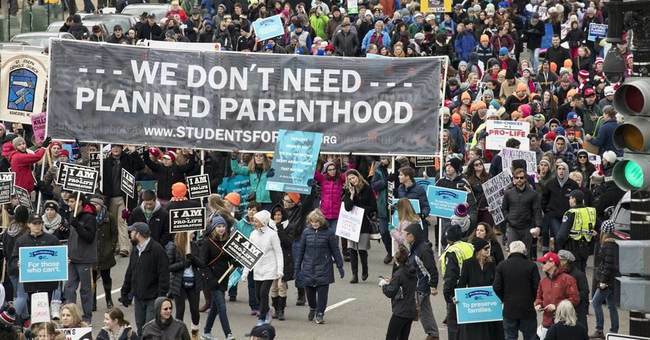 Planned Parenthood performed 321,384 abortions over 2016-2017, according to their latest report.